“And Then They Came for Us…,” California State University, Dominguez Hills’ daylong commemoration on Thursday, Feb. 9. marking the 75th anniversary of Executive Order 9066, which authorized the mass incarceration of Japanese Americans during World War II, will include keynote speaker Satsuki Ina, a renowned filmmaker who was born in the Tule Lake Segregation Center. On Feb. 19, 1942, President Franklin Delano Roosevelt signed EO 9066, authorizing the creation of military areas along with West Coast from which “any and all persons may be excluded” at the discretion of the secretary of war. The order paved the way for the government to remove tens of thousands of American citizens of Japanese descent and Japanese immigrants from their homes and place them in military guarded camps for over two years. 1 to 2 p.m., first floor Social and Behavioral Sciences building: Rededication of the Shinwa-en Japanese Garden, which was constructed in 1979 by local Japanese gardeners as a gift to the university. The ceremony will include words from historian and novelist Naomi Hirahara, whose parents survived the Hiroshima bombing. A plaque of remembrance will be unveiled. Artistic performances will include Okinawan dancers. The ceremony will be followed immediately by the academic symposium. Tom Ikeda, the founding executive director of Seattle-based Densho: The Japanese American Legacy Project. 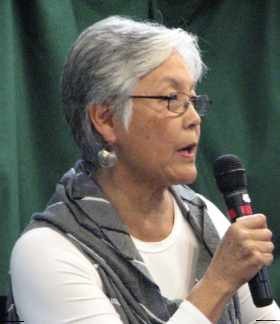 Ikeda, whose parents and grandparents were incarcerated at Minidoka, Idaho, has also conducted more than 200 video-recorded oral history interviews with Japanese Americans. Kim Yasuda, an artist and professor of public practice in the Department of Art UC Santa Barbara, whose work investigates the role of art, artists, and educational institutions in community development and civic life. 5:30 p.m., Library Cultural Arts Gallery, LIB-1940: “And Then They Came for Us… Archival Exhibition Marking the 75th Anniversary of Executive Order 9066,” which will provide an up-close look at materials from the collections in the archives at CSUDH as well archival materials from throughout the California State University system that are part of the CSU Japanese American Digitization Project. The project is led by CSUDH and funded by the National Endowment for the Humanities and the National Park Service. “The point of this commemoration is to continue to show our students and the public the connection between civil rights and freedom and fear and security. It had echoes after 9/11. It echoes today,” said Greg Williams, director of Archives and Special Collections, principal investigator on the CSUJAD project and curator of the exhibition. Keynote address, 7 to 8 p.m., Loker Student Union Ballroom C: Satsuki Ina’s documentary films about the Japanese American concentration camp experience, “Children of the Camps” and “From a Silk Cocoon,” have been broadcast nationally on PBS. She has just completed a book based on letters, diaries, and poetry written by her parents, who were held in separate camps. 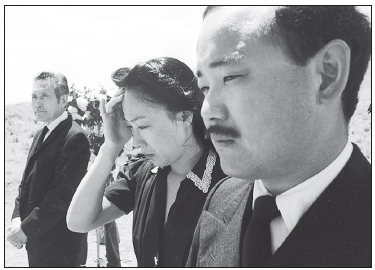 Clyde Kusatsu (right) and Akemi Kikumura, who later served as CEO of the Japanese American National Museum, in a scene from the 1976 made-for-TV movie “Farewell to Manzanar.” Kusatsu’s credits include the premiere episode of Fox’s “24: Legacy,” which aired Sunday. Monday, Feb. 6, 4 to 7 p.m., Loker Student Union, Ballroom A: “Farewell to Manzanar” (1976), directed by John Korty and based on the book by Jeanne Wakatsuki Houston and James Houston. A talk with cast member Clyde Kusatsu will follow. The cast also includes Yuki Shimoda, Nobu McCarthy, James Saito, Dori Takeshita, Akemi Kikumura, Mako, Pat Morita, Momo Yashima and Frank Abe. Tuesday, Feb. 7, 4 to 7 p.m., Extended Education Auditorium, EE-1213: “Going for Honor, Going for Broke” (2006), directed by George Toshio Johnston, and “MIS: Human Secret Weapon” (2012), directed by Junichi Suzuki. Johnston, who is also a Rafu Shimpo columnist, will give a talk after the screening. Wednesday, Feb. 8, 4 to 7 p.m., Extended Education Auditorium, EE-1213: “Children of the Camps” (1999), directed by Stephen Holsapple. A talk with producer Satsuki Ina will follow. Thursday, Feb. 16, time TBD, University Theatre: A performance of songs related to the camps. Tuesday, Feb. 21, 3:30 to 5 p.m., Levy Adult Center, Room 2, 3420 W. 229th Pl., Torrance: Osher Lecture Series: “The 75th Anniversary of EO 9066.” A lecture by two people who were among those incarcerated as children: Don Hata, CSUDH emeritus professor of history, and Hatsuko Mary Higuchi, an award-winning artist. Presented by the CSUDH Osher Lifelong Learning Institute. Wednesday, Feb. 22, 10 a.m. to 12 p.m., Extended Education Auditorium, EE-1213: Osher Lecture Series: “The 75th Anniversary of EO 9066.” See description above. For more information, visit www.csudh.edu/9066.